In reference to the patent application: US20140088397. There are multiple versions of the same thing I don't know which is which: US20150289775, WO2014047032. A friend of mine is a researcher in biomedical engineering. During literature review she encountered this patent filed by a seemingly prominent researcher, claiming the invention of a carbon black-doped PDMS electrode (priority date: 2012). However, the said device has been in use in the research field for almost two decades. A simple search on Google Scholar could easily present dozens of prior arts. However, there is more to it. the conductive substrate being flexible for electrical communication upon surface placement on the electrically sensitive surface. If I am reading it correctly, did they just claim all electrodes as their invention? 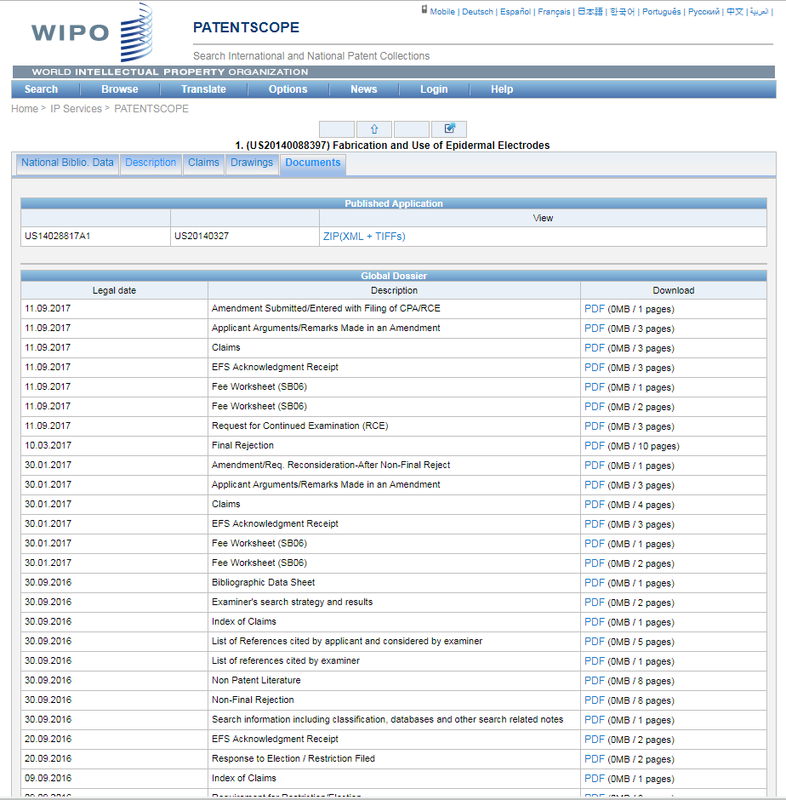 Thereafter a search on WIPO showed that they received a Final Rejection in March 2017, but they filed for Continued Examination in September, so it is still alive. Since it has been way over 6 months after publication or first rejection, I can no longer submit prior art to dispute this troll, right? Or is the PCT system different? In this period after the submission window, but before the patent is rejected/granted, what else can I do, hopefully without breaking the bank? Is the process of dispute identical to that after issuance? And is this really a troll? How do you invalidate a patent? Upon reading their latest amendment, my friend commented that adding hydrophobic treatment with a specific chemical to Claim 1 may get their patent approved, as it is disguised as a feature to permit underwater use. Whereas in reality all such PDMS devices, electrode or not, normally undergo hydrophobic treatment as part of the fabrication process. Should we be concerned that the Examiner could be fooled? As you can see, the inventors added a mention of FPOSS to differentiate over the examiner's findings. Essentially, additional findings were brought in to show that FPOSS is well known, and that bolting it onto the invention doesn't make the invention patentable. This kind of a song and dance is extremely common, and the application is still very much alive. It might get granted in a very restricted shape, or get abandoned, or go to appeal and be granted broadly - it's impossible to foretell. Not the answer you're looking for? Browse other questions tagged patentability us20140088397 or ask your own question. I had invented and published before this patent application - How do I get it invalidated?